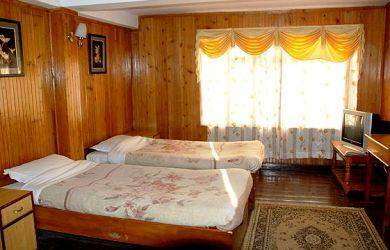 This is a nice traditional Tibetan style hotel offering 2-star amenities (although the hotel claims it's 3-star). The internal decor, the bright contrasting colors, the low furnishing, the wall carpets in the dining room and ceiling work are all inspired by Tibetan culture & style. It's owned and run by a Tibetan family and therefore you can expect courteous service and friendly atmosphere. The owner's family stays at the top floor and keeps a close eye on everything. 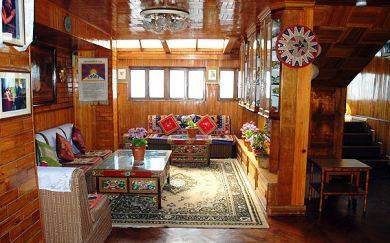 The lady owner may even invite you to her residence for a cup of tea and brief you about Tibetan culture and how Tibetan refugees ended up settling down in a place like Darjeeling, their family traditions and lot of other interesting stories. They have a strange reason for naming the hotel as Seven Seventeen. It seems all the members of the family over the several generations had either been born or died on seventh day or seventeenth day of a month. Strange but true... and hence the name. The hotel has two sections, one of them is the Heritage section with rooms that take you back to the colonial days, but still complete with Tibetan style & traditions. Several rooms are finished with wood paneling on the walls & ceiling. As you walk up the stairway, there are nice Tibetan artwork, printed cloth materials, dolls etc kept in the wall glass cabinets at the landings. The hotel has 44 rooms in total divided almost equally in the two sections. There are five floors, but unfortunately there is no elevator. Only few rooms have views. So if you care for good views, while booking or checking in, ensure that you get a room with a view. Some of the upper floors have better views compared to the ones in the lower floors. The regular section of the hotel has several double rooms, couple of triple rooms, a luxury deluxe and a super deluxe room (suit). While the heritage section has all double rooms and a suit. All rooms have standard amenities like TV, wooden cabinets/wardrobes, western style attached toilets, floor carpets etc. The hotel has a nice multi-cuisine restaurant (Blue Haven Restaurant) with candle lit tables. The menu is quite exhaustive and the dishes are quite okay. Channels running in the large screen LCD TV at the restaurant can be a good pass time. There is also a bar (Kadambari Bar). A gift and souvenir shop in the hotel offers many different small articles and knick knacks at very reasonable prices. The hotel also runs a small travel desk. Other in-house facilities include a small library, sitting lounge etc. 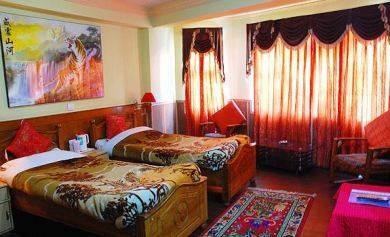 1) This is a nice & clean Tibetan family run hotel, and a good value for money. 2) If I don't like one thing about this hotel is it's frontage & location .... H.D Lama road in this stretch is jammed with cars & taxis, and is really awful. This is one of my key considerations while choosing a hotel ... a vacation after all is not about just staying in a room. Well there is nothing that the hotel itself can do anything about this. 3) The hotel is located right above the market area and therefore shops are all within easy access. The Chowrasta Mall is about 10 minutes walk (don't take the steep short cut to the Mall which takes 5-6 minutes of uphill walk ... it's a filthy lane). 4) While the overall service in the hotel is quite nice and friendly, they would need some improvement in promptness. Sometimes the service can be a bit slow. Owner is very nice and goes out of the way to help. This is a very safe hotel for families. 5) Limited supply of hot water (two hours in the morning and two hours in the evening). But that is the case with many other hotels in its category. 6) The best view rooms are on the top, but there is no elevator. Some 75 odd steps can be painful for some to climb. 10 minutes walk to the Chowrasta Mall. Hotel stay was nice, room was good, hot water for bath and evrything was near by to it... I especially was amazed to see a big TV/projector on mall road. Me and my mom have booked a hotel Pradhan Residency at mall road from makemytrip. I want to ask u if its a nice hotel to stay as I got to know about your site late otherwise i would have first asked before booking. As we both are females so will it be safe.. The hotel wasn't a bad one until it changed its hands recently and has been renamed from Hotel Seven Seventeen to Pradhan Residency. Also the location is quite bad when it comes to cleanliness and traffic. Safety should not be an issue. Hello Raj, I have gone through this site and details you provided are very helpful. I am planning to visit Darjeeling in mid june and looking for some info for Seven Seventeen (not heritage). I am travelling with wife and 2 kids - a daughter 5years old and a son 1.5 years old. Is it OK to book this hotel? I sent few emails to hotel for enquiry but they did not respond in a very pleasant manner and redirected to their website. I was asking about some basic things like - room views, location, distance from Mall, milk availability at hotel during evening/early morning hrs. Looking at the email response not sure how the staff is there and basic amenities? Can you suggest any good hotel for such small family as I mentioned above and also have facilities as required by small kids. Also suggest if it is better to stay near Mall (walkable distance) or little far in such scenario. Also another query I have on trains returning to Lucknow from New Jalpaiguri. Do all trains have pantry car in them and if required we can buy any food stuff from them or is it some fixed time delivery? I have a return reservation from NJP New Delhi Exp at 8:10 AM. Thanks in Advance. Hi, You will find my review of hotel Seven Seventeen and most of the related information in the section above. Kids facilities like availability of milk etc can be best answered by hotel staff. In general hotels of this category should be able to organize that. Service in Hotel Seven Seventeen is generally friendly.